Are toddler sunglasses necessary? Maybe not, but your little guy or girl certainly enjoys having them! And for some toddlers, sunglasses may be essential for keeping the worst of a summer midday glare from delicate eyes. Buy sunglasses for toddlers with the idea in mind that they will be soon broken; don’t spend more money than you’d be willing to put into something that is almost disposable. But choose glasses, too, that are practical and seem sturdy: a cheap plastic piece that will be broken in an hour is not worth the trouble spent ordering. Toddlers don’t yet have a concept of being careful with personal belongings, and they are so active that there are very few sunglasses that have any chance of long term survival—unless you buy the really strong, gymnast-style kind, and then they’ll still probably be left at some playground and lost. A light tint is usually enough for toddlers; thesuperstrong darker tinted sunglasses often get irritating for little people, who want to see the world look at least a little bit bright. Adventure KidZBanZ Age 2-5 Sunglasses – here’s one way of solving the problem of easily broken, easily lost sunglasses—cross a pair of super-cool sunglasses with some fun Australian goggles, and you’ve got Adventure KidzBanz Sunglasses. They’re sunglasses with good UV protection, but they stay on the same way goggles do—with a band around your child’s head, rather than that awkward earpiece. The band is adjustable by means of Velcro, so you can ensure a perfect fit. The downside to these sunglasses? Some little people just can’t stand wearing a band around their head, and if you’ve got one like that, your toddler will be pulling it off every three minutes. Not much use then. Still, if your toddler is one of those who doesn’t have a problem with the feel of them, these sunglasses may be the ideal eyewear for your child. 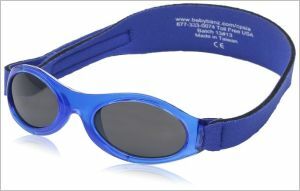 Another alternative is the Julbo Looping II Baby Sunglasses, Spectron 4 Baby Lens. These glasses look, from the front, more like traditional sunglasses, but the earpieces don’t curve down behind the ear, so there is no wrong way to put these on—backwards and frontwards are the same. They are kept on securely with an optional elastic cord that stretches from earpiece to earpiece, behind the child’s head. This may be more comfortable for your little guy or girl than KidzBanz,, and should stay on as well. They are shock-resistant, and so likely to survive a few falls. 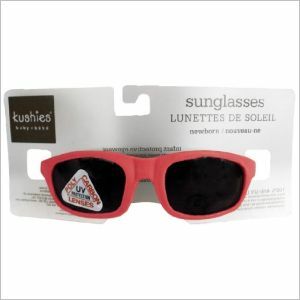 If you want to buy durable sunglasses your toddler can afford to lose, a nice option is Kushies toddler shades. These are sunglasses with scratch-resistant, UV-blocking lenses, and the arms are made entirely of rubber; so very flexible and very, very hard to break. They’re also very budget friendly. You have your toddler sunglasses, you have your sunblock; now get out with that toddler and enjoy the sun!